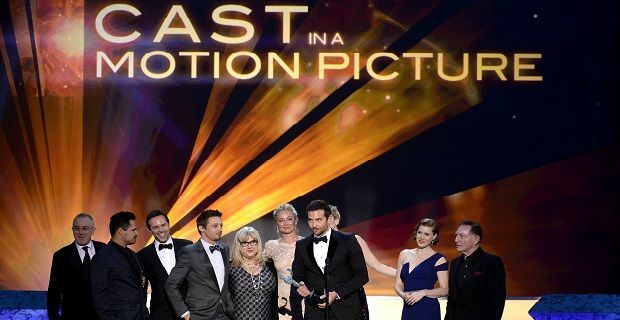 The cast of American Hustle were the biggest winners at the SAG awards 2014. They came away from the Screen Actors Guild awards with the Best Cast in a Motion Picture award in their hands. When the award was given to the cast that included Robert De Niro, Jennifer Lawrence, Amy Adams and Christian Bale, Bradley Cooper praised the director. "He is an actor's director," he said of David O. Russell. "That notion is tossed around. He is the embodiment of it." The SAG awards are seen as a great indicator of who will win the awards at the Oscar ceremony in March. Last’s best picture at the SAG awards, Argo, went onto win the Academy Award for best picture, but this year is far harder to predict as Gravity, American Hustle and 12 Years a Slave are all hotly tipped for success depending on who you ask. Lupita Nyong'o from 12 Years a Slave took the best supporting actress award at the SAG ceremony. She also praised her director, British film-maker Steve McQueen “for taking a flashlight and shining it underneath the floorboards of this nation and reminding us what it is we stand on.” The Kenyan actress was humble and honest when she picked up her award even going as far as to tell a story about calling her father to tell him she had won the part. “’Daddy, do you know who Brad Pitt is? I'm going to be in a movie with him!’” she told the audience. Matthew McConaughey was another winner on the night. His role in Dallas Buyers Club, a small film that cost just $4 million to produce, won him the best actor award. The movie is based on a true story of a homophobic man who contracts Aids and then smuggles anti-HIV drugs into America during the 1980s. Jared Leto who plays a transgender woman with Aids in the movie took the best supporting actor award.